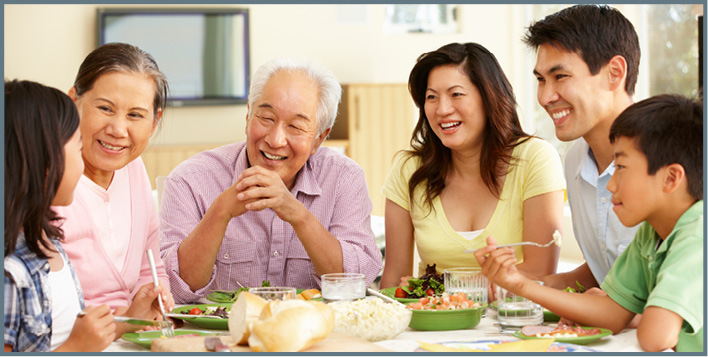 Family mealtimes provide a built-in opportunity to visit with other family members and enjoy good conversation. Good communication has been called “the lifeblood of any meaningful, close relationship.” Communication is the foundation of our interactions with others. Research on strong family relationships consistently has shown that good family communication is one of the cornerstones of a healthy family life. Few family traditions can be as helpful in providing opportunities for communication as family meals. • Clear the table and turn off distractions, such as the TV or phones, so you can focus on visiting together. • Try to encourage conversation among family members but set a reasonable time for being together, such as 30 to 40 minutes. • Keep the conversation positive. Avoid making the dinner table a time for lectures, angry discussions or discipline of a child. • Allow every person a chance to talk and share thoughts or stories so that all have a positive experience. • Bring up an occasional conversation starter, such as a current event or a favorite joke or story. • Encourage family members to linger for conversation, with dessert or snacks, so everyone can relax and enjoy talking with each other. Question: I grew up in a family where family meals were not a fun experience. I’m trying to change that for my own children. What do you suggest? • Ensure that children avoid teasing or rude behavior toward each other. • Avoid criticism and anger during family meals. Instead, encourage compliments and kind words for each other. • Shut off distractions, such as the TV, and focus on each other. • Treat each other’s views with respect, even if you disagree. Listen to children and let them learn to give ideas and listen to others. Question: My kids don’t always like the food I prepare. They only want corn dogs and chicken nuggets. What can I do? Involve children in meal planning and preparation. Have children select recipes from cookbooks and “take charge” of that meal. Kids are hands-on people, so have them help with age-appropriate tasks rather than watch. If children help plan and prepare foods, they are more likely to taste them, too. Preheat oven to 400 F. Stir turkey or chicken, vegetables and soup in an ungreased 2-quart casserole dish. Stir the remaining ingredients until blended. Pour over the turkey or chicken mixture. Bake uncovered about 30 minutes to an internal temperature of 165 F, until the crust is golden brown. Each serving has 230 calories, 6 grams (g) fat, 14 g protein, 30 g carbohydrate, 3 g fiber and 490 milligrams sodium. Quick Tip: Perishable foods should spend no more than two hours at room temperature.